The Grenada Back Row Seat is 7" taller than a Standard Grenada which eliminates the need for a riser. 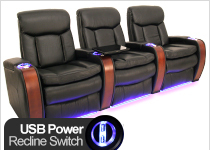 The Grenada Back Row theater seating is an ultra-padded home theater seat from Seatcraft that was designed to combine functionality, support, and comfort in one incredible package. With its expert back row design, you or a guest can sit anywhere and be able to see the screen, without the need for risers! This handsome model is a part of Seatcraft's exclusive Leather 7000 series, which painstakingly hand-picks from the top 30% of all hides to build the ultimate luxury chair. The Grenada highlights a three-section back with overstuffed headrests, with full bucket seating for premium lower body relaxation. 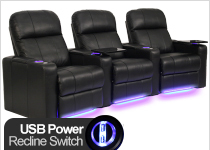 I purchased 6 Seatcraft Grenada movie theater seats. Everything came in perfect condition, I paid for white glove service. I had one small issue which was I was missing one cup holder insert. I called and spoke to Fernando Reyes and he was so great and apologetic. Fernando is the epitome of what a customer service person should be. Thank you Fernando! Awesome theater seats and even better customer service. I would highly recommend this company and would definitely order from them again.